The NBA may still be in the midst of its lockout, but basketball fans in Atlanta will still see more than their share of their favorite sport this season. Read more on how Georgia Tech plans to take advantage of the labor woes in professional basketball by clicking the link below. That's what a report from the Georgia Family Council and Heritage Foundation says. Read on for more about what it says. 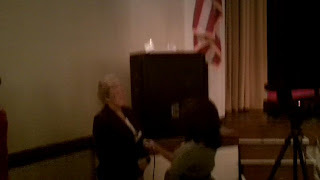 GNB PHOTO EXTRA--Who will be Albany's next mayor? Who will be the next mayor of Albany? That question will be answered three weeks from now, as early voting has already begun between three candidates: restaurant owner B.J. Fletcher, former city commissioner Dorothy Hubbard, and former state representative John White. All three candidates stood before the citizens of Albany on Monday, October 17, as they participated in a mayoral debate at the Albany Municipal Auditorium. The mayoral and city commission elections are scheduled for Tuesday, November 8. Photo captions: B.J. 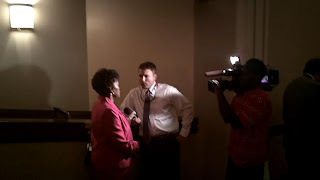 Fletcher (top) and Dorothy Hubbard (bottom) both speak to local television reporters following a mayoral debate in Albany, Ga. on Monday, October 17, 2011.